After having to update Tracks2Miles to work with My Tracks v2.0, Erik from TitanXT asked if there was anything that needed doing to make Tracks2TitanXT work as well. It turned out that no changes were needed but the route through My Tracks had changed enough to make creating a new walk through video worth it. So here it is. Just a quick update while I’m still working on a 2.x release*. * The plan is for 2.x to have a updated UI making use of fragments for tablet and ICS devices. After my last My Tracks patch had to be pulled (to be honest it did break sharing routes by anything other than Tracks2Miles) a new (safe) patch was accepted a few days ago. Once you have the track id then looking up all the details of that track using the My Tracks Library project is trivial (Once you got the user to allow 3rd party apps access). 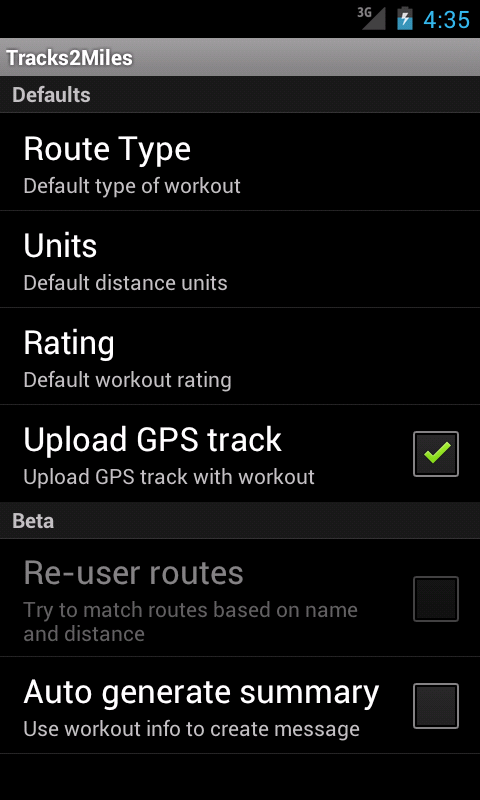 The latest version of Tracks2TitanXT has already been updated to use this method and Tracks2Miles will get an update for this as well as some better tablet support before the next version of My Tracks ships. About a month ago I was approached by Erik Morse from TitanXT to ask if I would be prepared to do something similar to Tracks2Miles for his site. At the time he did not have an API available, I said if he could run some thing up I would be prepared to have a look. Last week he sent me the details so I spent some of the long weekend running up a first pass of an app. 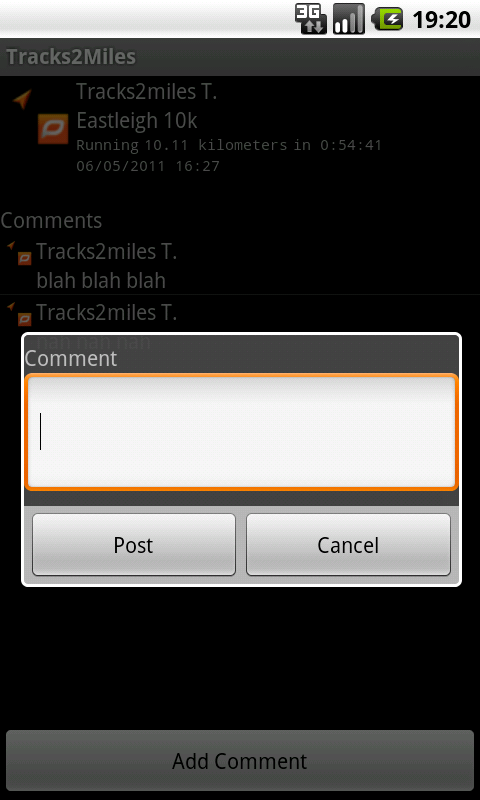 So Tracks2Miles now has a sister app supporting the TitanXT site called Tracks2TitanXT. It works in much the same way as Tracks2Miles in that it hooks into My Tracks through the “Share with Friends…” option, except as well as supporting GPX files TitanXT supports the uploading of TCX files which also contain heart rate information if you are using one of the Bluetooth heart rate monitors that My Tracks supports. The first pass is in the Android Market, it needs a few more bits of error handling and some cosmetic changes but I thought I’d let those that want to have play. Added a timeline view to see what you friends have been up to. I’ve just noticed that on some phones that after the update the launch icon will still open the Activity for publishing a new workout rather than the Timeline Activity. This is a “feature” of some of the launchers, you may need to restart your phone to get it to see the update. Fixed up a couple of race condition type problems. Updated the code to import from My Tracks to use the patch that has been accepted for the next release. 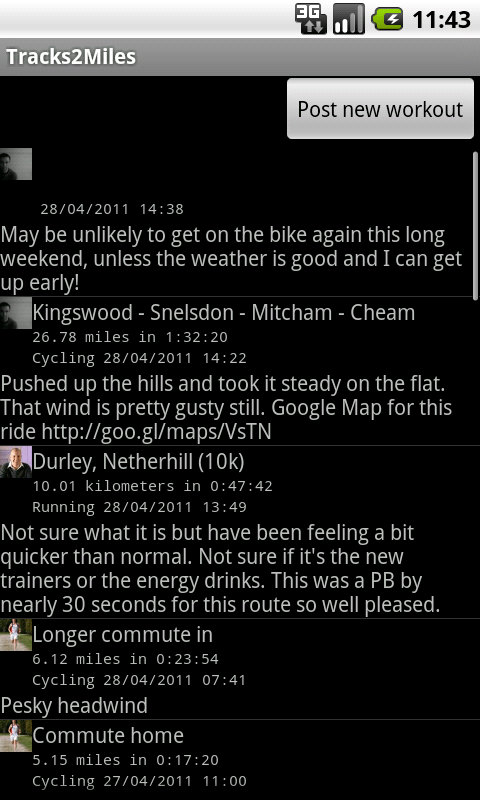 The guys at My Tracks have integrated the changes I sent to enable more data to be passed with the GPX file. There are some slight changes needed to the currently released version of Tracks2Miles but I will push a new version in the next couple of days to be ready for the next My Tracks drop. In the meantime here are the details of the change so others can use it to build similar add-ons for any other site (why they would want to use anything but dailymile?). This hooks the “android.intent.action.SEND” action and filters it for the mimeType “application/gpx+xml”. So in the Activity that gets called when an intent matching this is broadcast you will need a onCreate method that looks something like this. Where Track is an instance of com.google.android.apps.mytracks.content.Track. You will need to grab this and the 2 classes in the package com.google.android.apps.mytracks.stats so they can be on the classpath for getParcelableExtra to find them. From the Track object you can get hold of name, time and distance of the workout and also there is a Statistics field that has info on average/max speed, elevation information. I’m planning on writing a My Tracks wiki page about this some time soon where I’ll go in to a little bit more detail but this should get most people started.